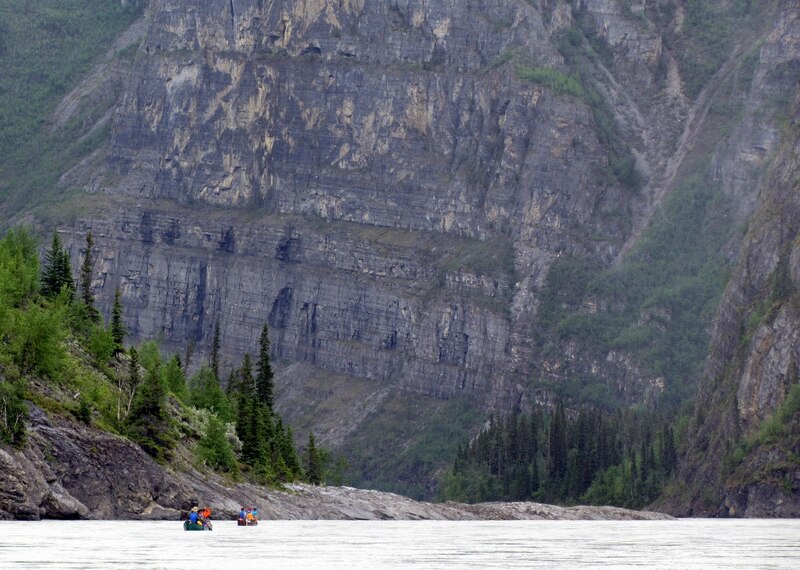 One reason that the South Nahanni river is a Unesco World Heritage site, is its diversity. 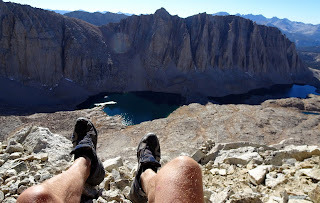 Those who have read my blog entries have followed it from being a rambunctios teenager in the Rock Gardens through the vigorous vitality of youth to when it slipped into the comfortable mellowness of middle age after Rabbitkettle. These are of course metaphors that can be used of many rivers. But after the crescendo of Virgina Falls you are hard put to imagine anything but an anticlimax. Nothing could be further from the reality; the South Nahanni shifts gear in an amazing and unique way. 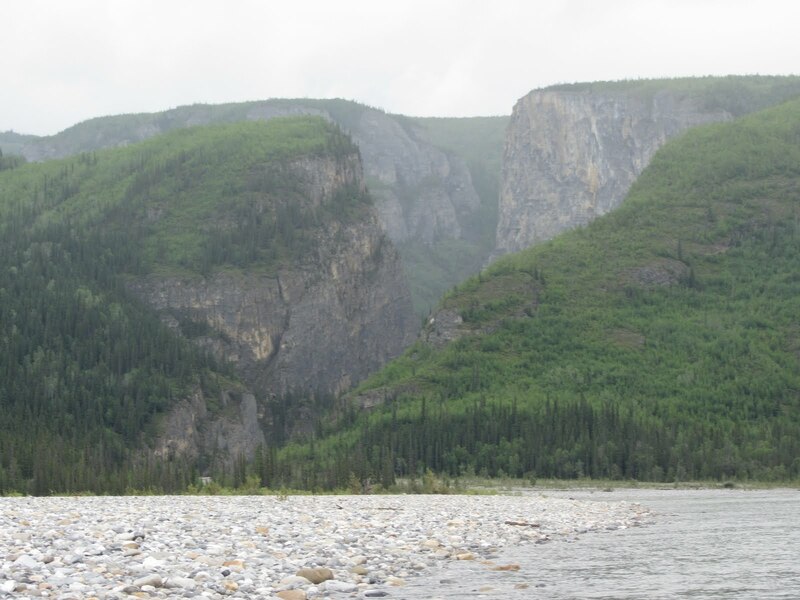 Below the Virginia Falls portage trail the Nahanni makes a complete shift from a river shaped by the last ice age into an antecedent river. Four tremendous canyons line the meandering river for another 150 kilometers. The key word here is 'meandering'. Rivers that can cut through rock usually does not meander, they cut it as gently as a meat cleaver; that is straight through. An antecedent river is "is a stream that follows a course that formed before the tectonic uplift of the surrounding terrain and maintained its course through continuous downcutting of its valley" to quote Wikipedia. 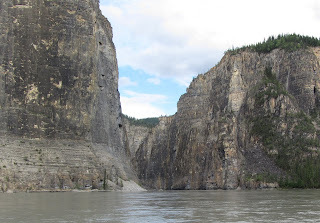 So the Nahanni had meandered across a plain once upon a time. And the the plain had started rising. Slowly. And the river had kept its meandering course by cutting through the hill rising in its way. For a long, long time. For this to happen you need a unique balance between the force of the river, the hardness of the rocks and the speed by which it is being lifted into the path of the river. The Grand Canyon has been shaped the same way. This photo shows how you leave the banks below the falls; ferrying upstream like mad in the canoes and still being swept downstream by the current. You have to stay away from the outside bend at the very right of the photo at all costs. Mid river or sneaking around close to the left corner is the way to go. After that you do not know much of what will happen around the next corner except for the cheerful mumbling of the river guide about "high standing waves stretch almost the entire lenght of Fourth Canyon". 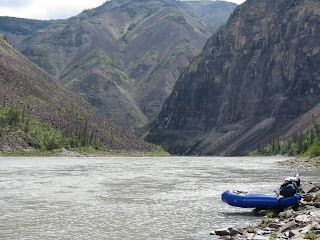 I had decided not to venture through Fourth Canyon completely solo, so I talked to Dave the guide about floating down more or less attached to his group that had now swollen to four canoes and a raft. That way at least someone would be around to pick up the scraps, or maybe even all of me, I figured. 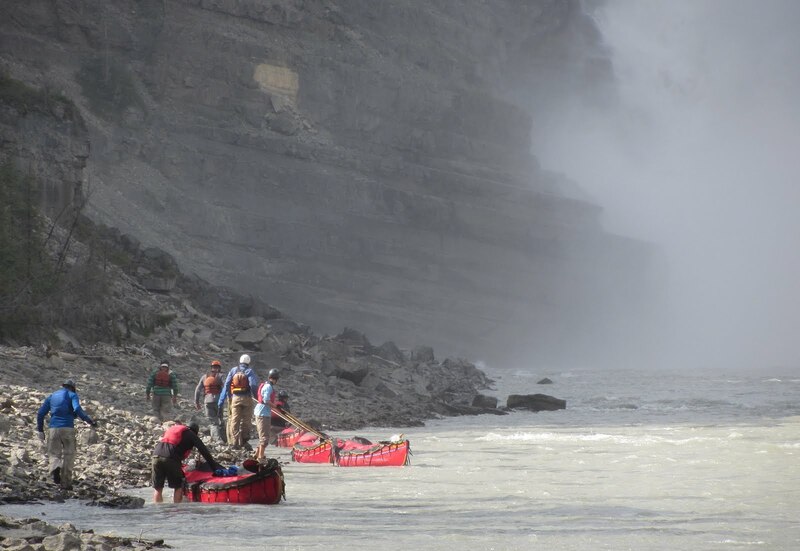 The canoeists in Dave's group walked up closer to the falls in order to have maximum length of river to use while ferrying across far enough to avoid the outside of the first bend. In the end I chickened out and asked Dave if I could ride in his raft together with Wally, Doreen and Nancy, through Fourth Canyon. They had in fact seen my qualms and already talked to Dave about this, it turned out. So, no problem. 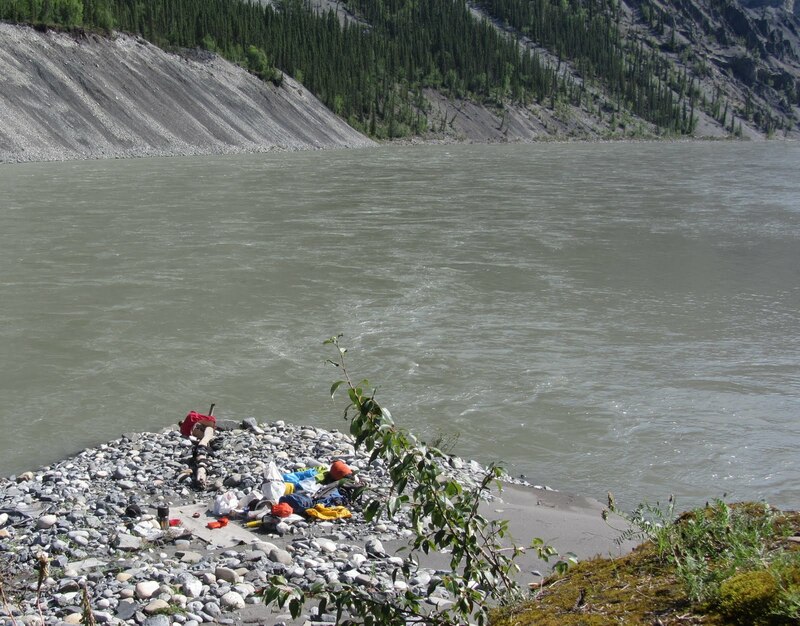 I deflated my packraft and slung my pack on top of the load. Riding in a big raft like this was, as David had told me, like riding in a tank. 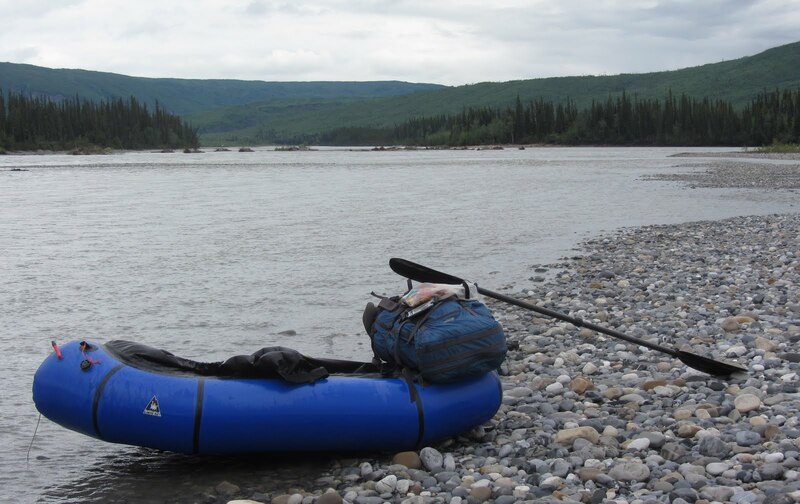 There is not much that can happen to a raft this size, as long as you do not get stuck on a rock and have the current flip the whole caboodle that way. 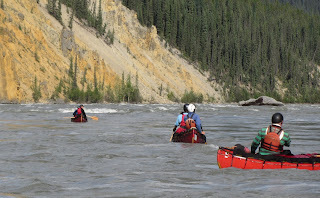 While the canoes avoided the highest standing waves we went straight through them. More fun for the clients. ﻿We had to wait for about 20 minutes for the canoes to catch up, since one of them had overturned. Later I also found that my friends the Limeys had one flip in Fourth Canyon. This made me even more confident about having made the right choice when hitching a ride. I was not here to prove anything, neither to mysefl or to anyone else. As one of my fellow passengers put it: Your family will think you made the right choice. Waiting in Fourth Canyon can by no means be considered painful. 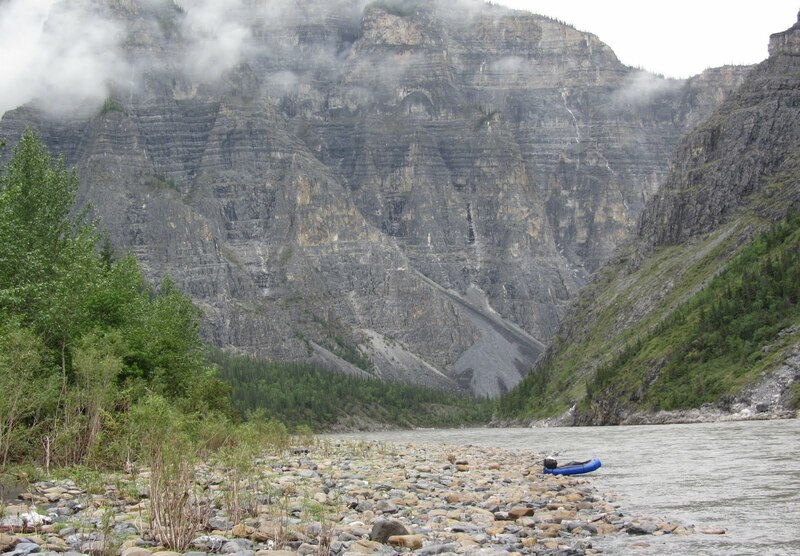 It has been said to be the most beautiful of the canyons of the lower Nahanni and I will readily agree. Compared to the canyons that will follow, the walls are not that high, but the magnificent coloring brought to vivid life by the sculptured limestone is what leaves you stunned. No photos by this photographer can truly capture the magic of light and shadow playing on these cliffs, all orchestrated by the clouds playing across the sun getting low on the horizon. It took about an hour to pass through Fourth Canyon. 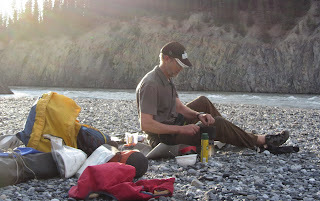 By this time the shadows were lengthening and Dave and his group stopped at Marengo Creek and started setting up camp. Me, I inflated my packraft, said my goodbyes and started paddling downstream on this magic summer evening. Dave had tipped me off about a good campsite for a small group; just below Figure 8 rapids. 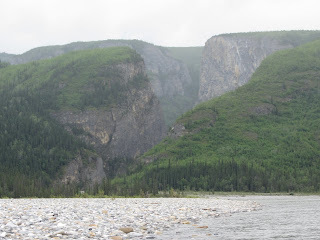 This is a special place for anyone who has read about the Nahanni, like I had. Figure 8 a k a Hell's Gate, is one of the major obstacles on the whole river, and certainly below Virginia Falls. 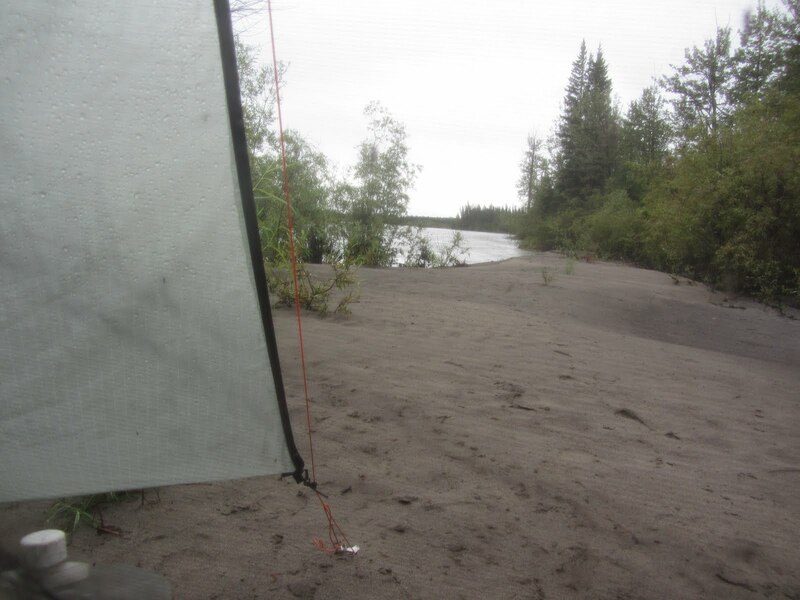 This did not worry me, because there is also a well established portage trail that I had every intention of using in order to then set up camp on the gravel bed seen above. RM Patterson, author of The Dangerous River, describes what Nahanni river legend Albert Faille said the first time they both saw Figure 8 rapids in 1927: "Strangest piece of water I ever did see". Today Figure 8 is much easier to negotiate than it used to be, because the gravel bank seen in the upper left corner of the photo got flooded to pieces a few years back. Before it was connected to the bank to the left outside the photo. 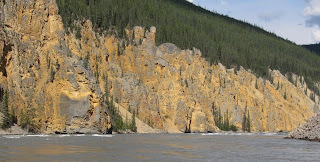 This gravel peninsula then led the whole might of the river straight into the rock wall, the 90 degree corner of which can be seen at the upper right of the photo. This whole mighty flow of water then bounced back and across, heading more or less straight for the rock wall from which I am taking the photo. Some of it did of course slip around the corner and downstream out of the right hand side of the photo. After hitting the rock wall at my feet some water was split of to the right and downstream and some back upstream, forming a big eddy in the bay there. 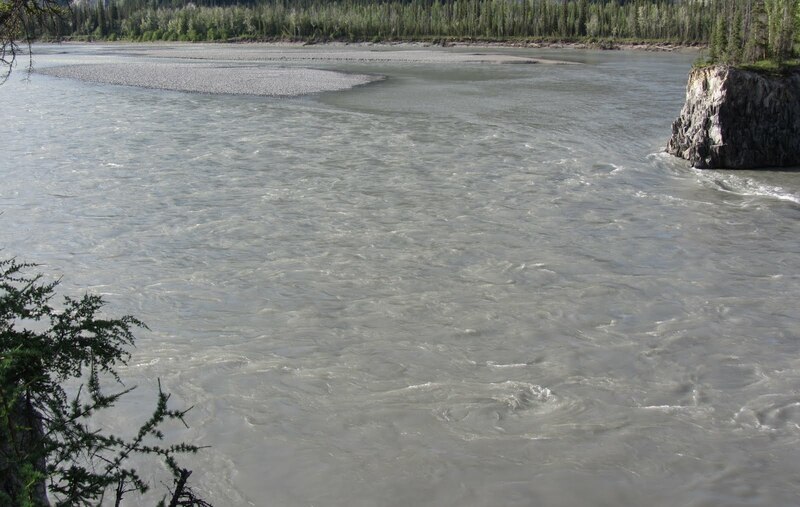 With more or less the full might of the river taking two 90 degree turns in a very short distance, the under currents and whirlpools you encounter in Figure 8 are legendary. Fully loaded canoes, with all the flotation that entails, have been said to be sucked under for 30 seconds in whirlpools here. 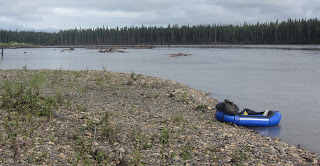 Today the river runs much more straight through the Figure 8, since much water can pass around the big gravel island that used to be a penisula. A couple of hundred meters downstream there is another bottleneck, as can be seen above. And beyond that the end of the portage trail and a beautiful campspot. 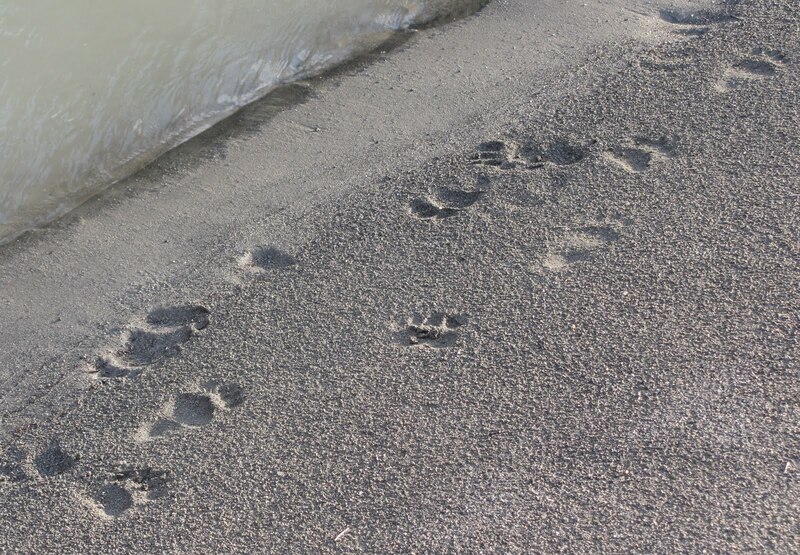 On the edge of the bar I saw some tracks from mama bear and baby bear. Most likely black bear, they were not big enough for a big grizzly IMHO. Yessss, this is where I want to camp, I exclaimed and proceeded to get my tent in place and gather fuel for my Bush Buddy. So in the mild evening light, as the day was going home, I cooked my noodles and stuffed myself with sausage and cheese. These were gifts that David had wanted to get rid off, now that he had received added supplies and clients by air. 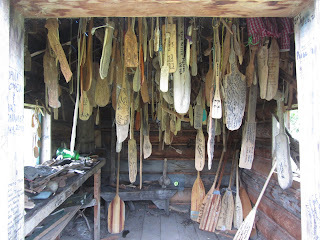 In fact, a number of canoers that I had met had asked if I had enough food, which I thought was very nice of them. The truth is that I had food, but having stayed longer at Virginia Falls than planned, had begun to ration things like mashed potato powder and muesli down to half portions. So the extra calories that Dave kindly provided were really welcome. Looking back, this particular evening was a high-light of the trip that will linger in my memory bank, safe from inflation and recession. Something I will savour when I am sitting on a porch somewhere with a blanket across my knees, while my brain leafs through some of the snapshots life has given me. The morning after I got onto the river again, and the speedy current whisked me along. Wrigley's Whirlpool and Tricky Currents were easily avoide by sneaking close to the inner curves of the river where they resided. Downriver I went, past the big tributary Flat River, where most of the search for gold in the area once took place. Further along a rocky beach at the downstream end of a small island became the spot for another sunlicked lunch-break. As can be seen on the photo, the current on both sides of the island is swift, but right at the point of a place like that you will find an eddy with un-moving water where you can easily step ashore. After Fourth Canyon comes Third Canyon. Not as colorful and not always as vertical, but with higher canyon walls than Fourth Canyon. The high point of Third Canyon, where the walls certainly are vertical, is The Gate. For anyone who has seen the Lord of the Rings-movies, The Gate brings to mind the Argonauts, with their giant sculptures of ancient kings guarding a narrow river passage. The walls on each side are 460 meters high and the distinctive pillar in the centre of the photo was named Pulpit Rock by RM Patterson. This is an upstream photo of The Gate, taken after my passage, with Pulpit Rock almost invisible against the wall on the right. The river makes an at least 90 degree bend coming through this narrow passage. That would usually mean turbulent waters, but I floated through serenely enough. A not so wild guess is that the river deepens enough here to compensate for the narrow passage. A well known camp spot in Third Canyon, Big Bend, has lately been closed for reasons of over-use. I was tipped off about there being a nice spot to camp at Painted Rocks Canyon, but evening caught up with me before I got there. A couple of klicks before the Big Bend, where Third Canyon sort of slips into Second Canyon, I found this huge gravel bar. 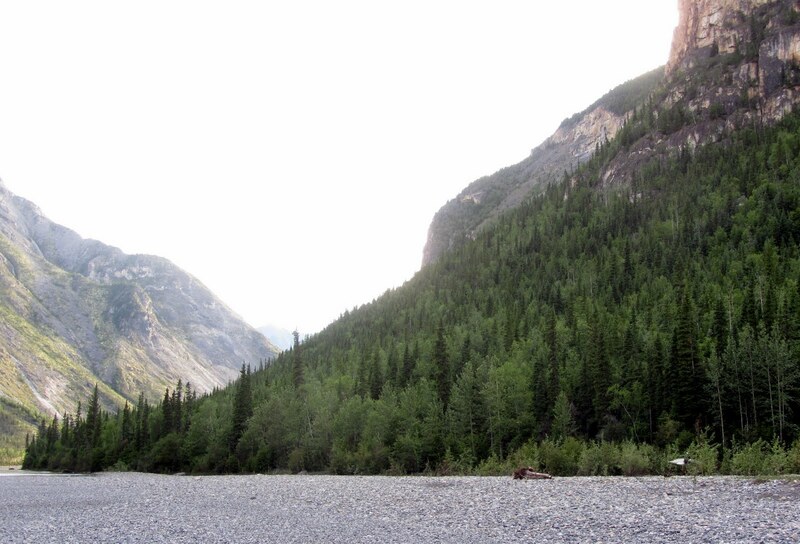 The size of the bar and the canyon walls can be guessed if you know that the white spot among the greenery in the lower right hand corner of the photo is my tarp, set up for the evening meal. 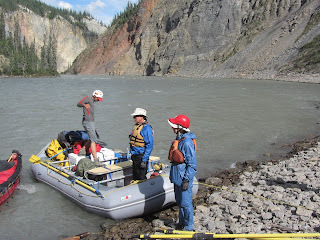 Third Canyon is comparatively short, 15 kilometers, and passing Headless Creeks signals the end. It also signals the beginning of famed Deadmen Valley. These names are reminicences of the two McCloud brothers being found dead and headless here about a hundred years ago. Foul play has been suspected, as well as death from a bear attack and what not. Reputedly the brothers had found gold, and...no one knows. Deadmen Valley is a wide spot compared to the canyons I had recently travelled so I had expected the current to be sluggish here, but far from it. I was swept through this area almost too fast. Driftpiles and strainers kept me on guard, but not quite enough. Before realising that a huge gravelbar blocked my entry to Sheaf Creek I drifted past the point of no return. With the current against me I could not make it to the mouth of this small tributary where RM Patterson had wintered in 1928. The weather, overcast and with occasional showers, also made it easier not to persist in visiting this spot. I stopped at the nearby unmanned wardens cabin and signed into the Parks ledger. 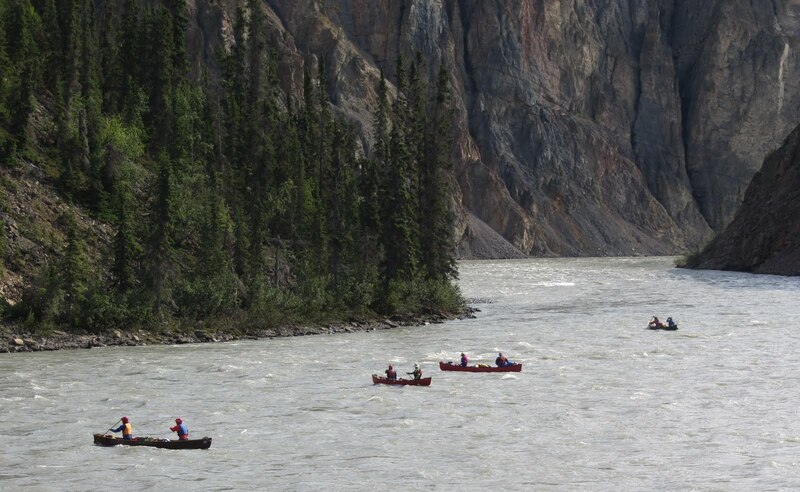 An american group of canoers had signed in earlier the same day. "Buggy" was their comment. They were not kidding. Another reason to move on. 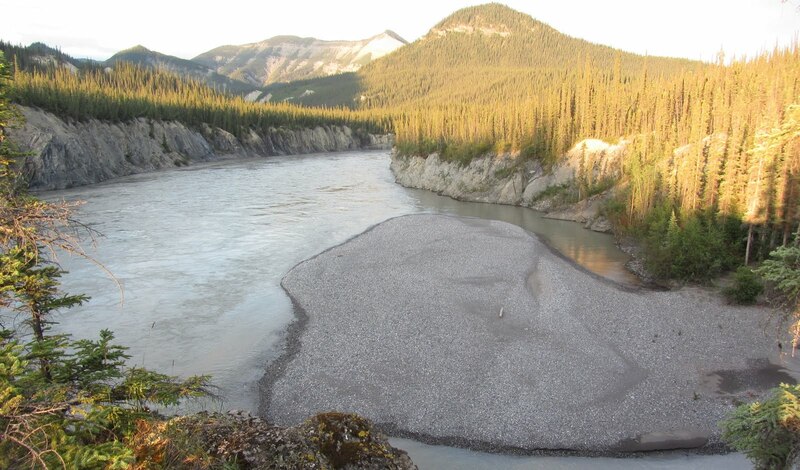 Prairie Creek, with its gigantic alluvial fan on the Nahanni, enters through a gash in the surrounding mountains. 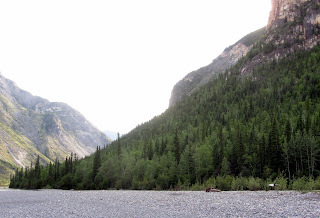 The canyon is reputedly magnificent and I had planned to camp in Deadmen Valley, to spend time at Sheaf Creek and day-hike up Prairie Creek. But being behind schedule and not knowing for sure how fast I would be able to arrange transport out of Nahanni Butte, where the Nahanni joined the Liard River, I pushed on. The weather contributed to my decision as well, it was gloomy and with sporadic rain. Today I regret not spending more time in this area, but hindsight is always easy. Where Deadmen Valley ends First Canyon begins. And First Canyon is the truly most magnicent and greatest of all these marvelous canyons. 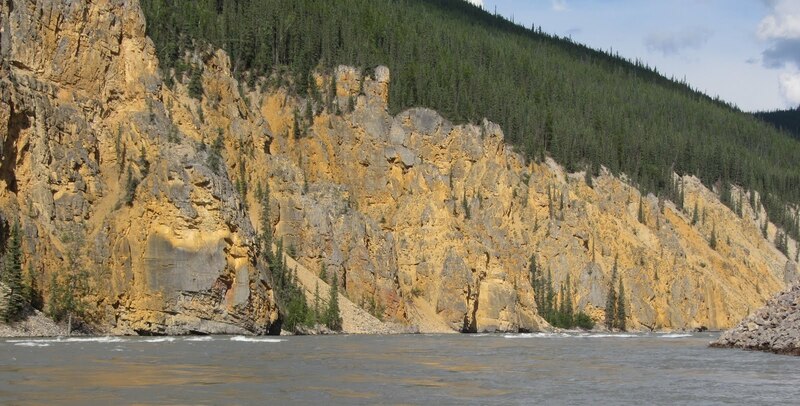 In places limestone cliffs of almost 1000 meters falls steeply into the rushing water of the river which has carved and shaped these walls during the eons. 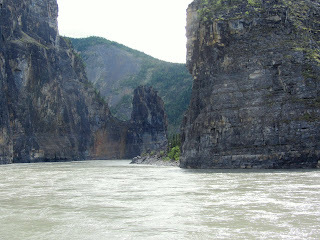 Ahead of me I could see the group of American canoeists on their way into this famous gorge. It was late in the day and it was raining when I reached the entrance to First Canyon. 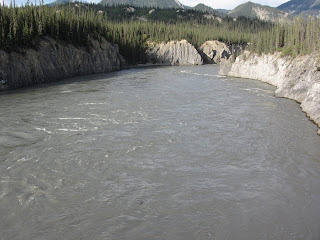 Guarding it is the worst remaing whitewater obstacle on the Nahanni; George's Riffle a k a Cache Rapids. I did not want to spend a night imagining what that would be like. Better to get it over with and then camp on the other side of this stretch of huge standing waves. 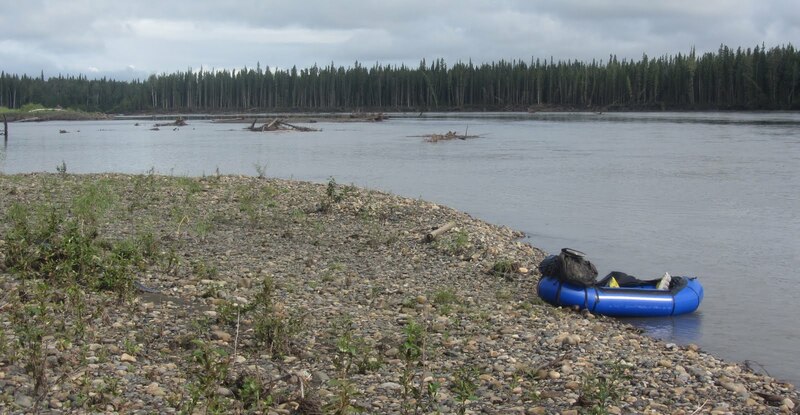 The river splits around an island, where going to the left of the island makes it possible to avoid the riffle. Scouting this on foot I found this to be mostly true. Still, the narrow river with the waves slanting across from one side to the other and a protruding rockpile from river left made it impossible to avoid more than about 75% of the long riffle. I carried my raft across the island and got into the water, planning to follow the outskirts of the rapids, just so I could sneak by the protruding rock. It worked well up to a point. Being to scared of the whitewater I got too close to the very powerfull eddy line above the protrusion of rock from the left canyon wall. Being halfway in and halfway out of an eddy that strong is no place to be and before getting sucked in I paddled out into the waves. Now it was a question of not getting to close to the rock outcrop while still managing the erratic waves, clinging to the outskirts of the whitewater. For a second, just after having swept past the rockpile there seemed to be waves coming from all directions and I was gutwrenchingly close to loosing my balance and overturning. But through luck or by saying all the prayers I knew I stayed on the right keel and then I was through. Out of the wave-trains, continuing down on the swiftly moving river. Me, I was looking for the next suitable gravel bar on which I could camp and rest after a long and tiring day. Around a big bend by an awe-inspiring limestone wall decorated with shredded clouds I found my bar and pulled my raft up on the beach. The following morning the current brought me through First Canyon. Even in the rain and with clouds blocking some of the view, the majesty of the rock walls was impressive. However, the weather being what it was it did not tempt me to a lot of photography. I would of course have liked better weather in First Canyon, but I felt that I could not complain; all in all the weather had been great for most of my trip. 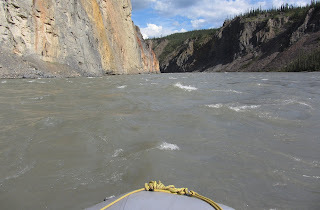 The last stretch of whitewater in the canyon and on the Nahanni was Lafferty's riffle, but contrary to Georges's this one was one hundred percent avoidable by keeping to river left, since it did not slant across the river but stayed by the right canyon wall. 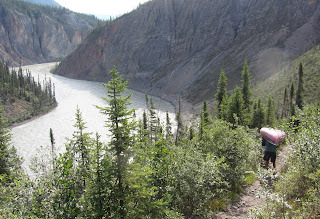 Before I knew it and really wanted it Fourth Canyon ended and the canyonlands of the Nahanni were behind me. Kraus' Hotsprings are situated where Fourth Canyon ends and I hit them at lunchtime. It was raining, but I quickly joined a group of Canadian canoers which I had met briefly at Virginia Falls about a week earlier. 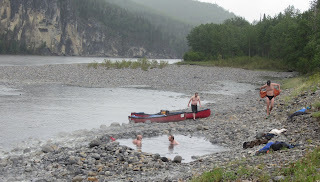 Soaking in the nice, hot water in the drizzle was an enjoyable experience after a chilly and wet morning in the packraft. At Kraus' Hotsprings is a small cabin with another check-in ledger from Parks Canada. The cabin is full of paddles of all sizes, mementoes of groups having gone down the river and signing their names on these more or less artistic artifacts. It was now raining pretty insistently so I pitched my tarp and fired up the Bush Buddy for a lunch meal, before continuing down into the Splits. The area known as The Splits is, unsurprisingly, where the river splits up after reaching a flat area. It is a delta with lots of channels, lots of snags, driftpiles and strainers. An area with dangers that are easily underestimated. 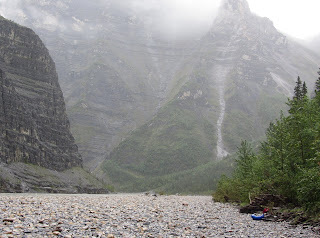 Not knowing but suspecting slow moving water and strenous paddling in this area, I pushed on in the rain. Besides it was one way to keep warm. Surrounded by forests it was not always easy to see where the main channel of the river was. At times like that I stopped paddling and let the current show me the way. It turned out, like in Deadmen Valley, that the current even in this semingly flat area was surprisingly swift. As the evening drew nearer I realised that if this continued I would have no problems in reaching Nahanni Butte by lunch the following day. 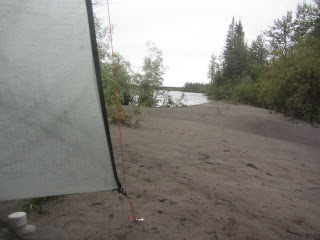 My last camp was on a sandbar in the rain with the worst mosquito experience of the whole trip. 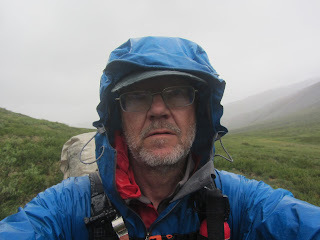 Having had a cold day in my raft, with a leaking drysuit and my rainjacket on top not enough to keep me worm, I had also paddled in my puffy layer, the Cocoon Pullover. It was thoroughly soaked as well, but sitting under my tarp with the Bush Buddy between my knees I dried out pretty fast and kept warm while cooking my noodles. After that I retired to the sancity of my tent where I could eat safe from the moskers and comfortably warm in my sleeping bag. The last day on the river started out overcast but soon turned sunny and warm. The first kilometers went swiftly by, but after that most of the current died down and there were a number of slow and long meanders to paddle. On occasion I was paddling away from my destination. Splashing along here I was passed by several groups of canoers. The bell shaped mountain seen in the photo above is Nahanni Butte, and at the foot of it the native village by the same name can be found. As I was approaching the dock a float plane landed. Right by the beach was fairly new building with the local office of Parks Canada. 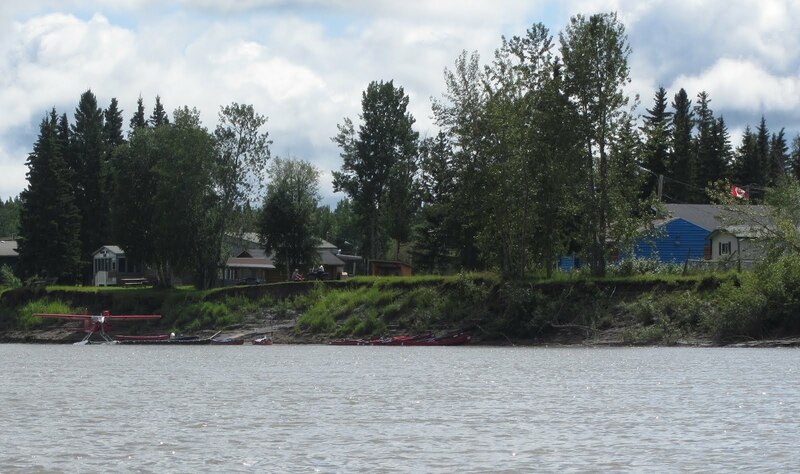 Here I checked out of the park and proceeded to find a way to get from the village to Fort Simpson some 300 kilometers down the Liard river, and where flights to Calgary via Yellowknife would get me back to friends and family. 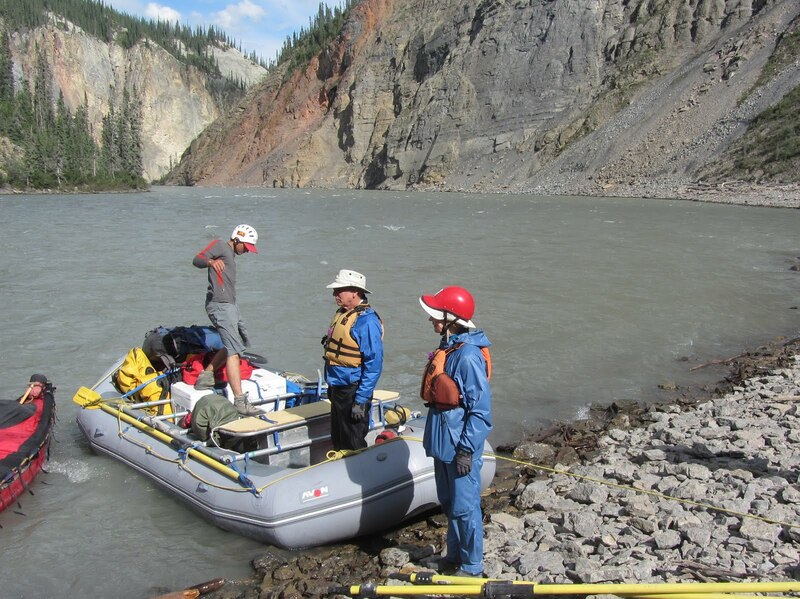 There is no road from Nahanni Butte so this transport would involve a water taxi and a land taxi, both expensive for a single passenger, it turned out. However things would go more smoothly than I could dream of. 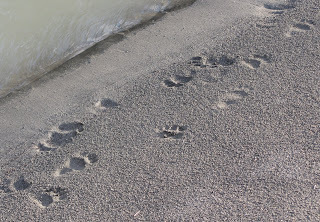 A guide, from one of the groups that I had chatted with briefly as they paddled past me in the doldrums of the meanders earlier that day, had paved my way. 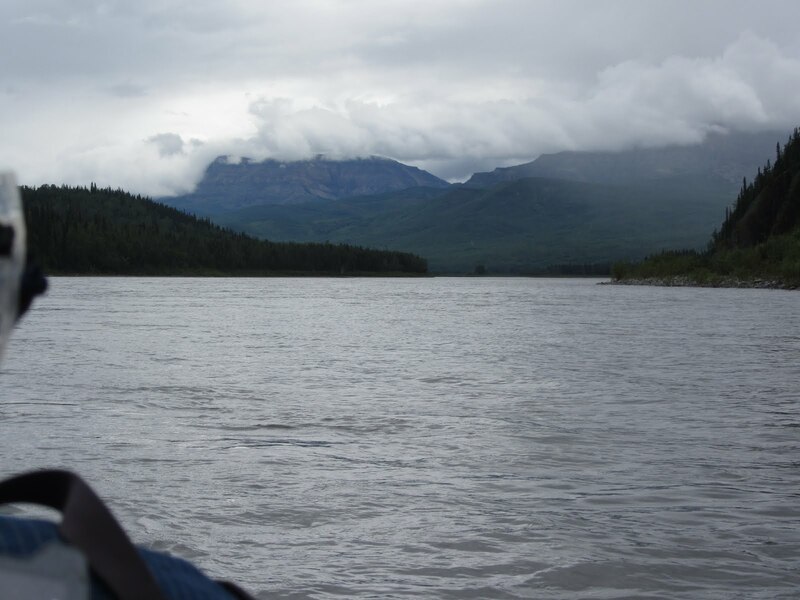 He ran into a bushpilot that he knew in Nahanni Butte and it turned out she had room for one more passenger in her plane heading for Fort Simpson. So before I knew it I was loading my pack into a small plane and we were airborne. And I did not even know the name of the guide that this way helped me save 500 CAD. Another helpingl hand among many that made my trip such a great experience. Aw, those Canucks, they're so helpful. I just love'm. 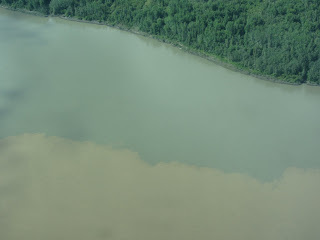 Taking off from Nahanni Butte I could see where the silty, glacial water of the Nahanni slowly, almost reluctantly, merged with the muddy brown water of the Liard. 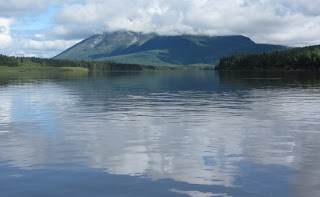 Soon no one would be able to see any trace of Mt Wilson mirrored in the Moose Ponds or the misty cataract of Virginia Falls as the Liard would merge with the Mackenzie and finally empty itself into the Arctic Ocean. But some molecules, I was certain, would carry memories of snowcapped mountains, drunken forests and gravelbeds basking in the sun. And so would I. A truly awe inspiring read, the canyons are amazing, the storytelling magnificent. I have enjoyed every section of this tale. I have been following every episode of this trip with increasing interest and anticipation. Great telling of a wonderful adventure! Really great series and amazing photos. I've enjoyed reading. 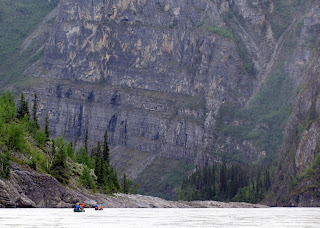 I hope to do a long river trip like this one day. Thanks for sharing. Great photos and trip report - could be longer and no risk oft getting boring with your mix of sharing thoughts, feelings and descriptions. I like it! Jörgen the scale of the river and its vastness was so well captured in your photos and writing. Just superb from start to finish. "Looking back, this particular evening was a high-light of the trip that will linger in my memory bank, safe from inflation and recession. Something I will savour when I am sitting on a porch somewhere with a blanket across my knees, while my brain leafs through some of the snapshots life has given me." Thanks. Oh, I took lots more photos, I just used the ones appropriate to tell the story. And some are pretty poor as well. I considered buying a helmet camera, sort of a last minute idea, but thought it was too expensive for something of minor importance. I mean, it would have resulted in a couple of minutes of whitewater rafting to show, that's all. I had considered filming my trip. The problem, for me anyway, is that it takes a lot of hard work to make a good film when you are alone. In the end I decided it would take away too much, or change to much of my experience. Snapping a pic every now and then is much less demanding. It's taken me this long to get around to reading this, but it was well worth the wait. You really conveyed the experience well. I'm somewhat in awe of your adventure in Nahanni. I'd love to think I could one day do a trip like this, but in all honesty I think I'd be scared shitless. I would definitely have jumped in the tank raft, and probably stayed in it. A great series of reports, Jörgen! 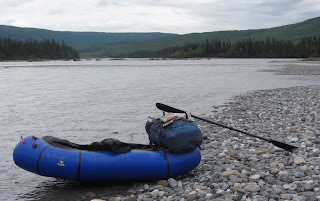 Well, I was pretty scared at times as well and have not yet regained my fondness of packrafts.